This core finding has come from the final report of the Commission on Fake News and the Teaching of Critical Literacy Skills. The Commission was run by the All-Party Parliamentary Group (APPG) on Literacy in conjunction with the National Literacy Trust. The NLT has now published a series of free resources focusing on fake news and critical literacy in a bid to help schools tackle the issue. The report – Fake News and Critical Literacy – also finds that half of children are worried about not being able to spot fake news, while two-thirds of teachers believe fake news is harming children’s wellbeing by increasing levels of anxiety, damaging self-esteem and “skewing their world view”. The report warns that fake news is creating a “culture of fear and uncertainty” among young people. 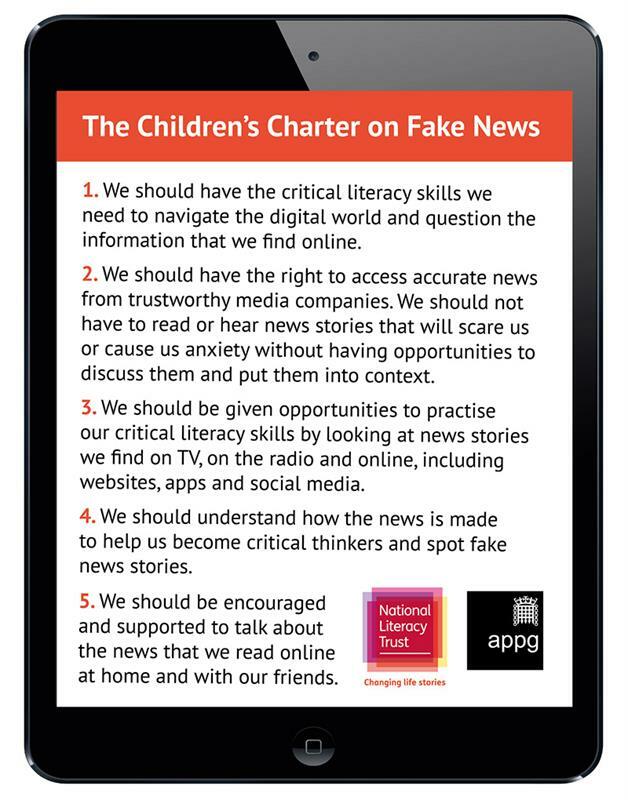 The Commission has also launched a Children’s Charter on Fake News – pictured – encompassing five areas of change that it believes will give young people the skills and knowledge to confidently “navigate, analyse and assess” the validity of the news they see. The NLT resources, published in response to the Commission’s findings, include practical lesson ideas, critical questions and a directory of useful organisations and further resources. There are also discussion cards to help students think more critically about the texts they read in lessons, which can be used in all subjects and with all text types. Lucy Powell MP, chair of the APPG on Literacy, said: “Many children told us that they lack the literacy skills needed to identify fake news. This is causing them to mistake false news for fact, become anxious as they believe misleading stories, and risk exposure to malign agendas. “The digital landscape is evolving at a tremendous rate but the literacy skills children need to thrive in this world are not keeping pace. Jonathan Douglas, director of the NLT, said: “We have uncovered a dangerous lack in the literacy skills that children and young people require to navigate our digital world and identify fake news.